This solution caters to the content providers (Mainly Education Content Providers) that want to sell and manage the content distribution to the end consumers directly. There are 4 flavors of this solution. All these flavors’ workflow is fairly similar and can be understood from the description below. Upon receiving the SD card, the user is required to insert the SD card and launch the app on their device. This takes the user to Sign-in page (first-time users is required to click on Sign-up in order to register on the system. Existing/earlier registered users will be required to Sign-in using the combination of email/username and password set during registration. New users will be required to register on the app by providing requisite details in the user registration form. This would initiate a vetting process to authenticate the users by sending email on email ID provided during registration. Post this; the learner access is authenticated based on the hardware key of Android device the app. Once the device IMEI is captured and recorded on the server, the user lands on the app Home screen and has access to other sub-sections of the app. Upon activation, the SD card is locked and work only on the Tablet/Phone on which the user has activated the account. Upon activation, the user gets access to content for a period predefined in the license (Usually 365 days), and would receive a notification to renew subscription to access to the content beyond this period, and/or order a card for next Class/Standard. The Homescreen of the app is the main landing screen, This screen is white-labeled and designed to ensure that the branding and flow facilitates ease of use to kid’s to surf through the app and access relevant content in just a few screens. The Homescreen also serves as a gateway to all the sections and subsections of the app and highlights the various essential sections. The app users are able to view the account details, and remaining number of days for content access for him/her. The administrator displays notifications to the user via this section. The notification/messages also includes communication regarding any new product/promotion and renewal reminder or link for buying new content before expiry of the subscription term. Administrator is able to convert the content for each class by using this Tool. Once the DRM protected content is copied on SD cards, administrator is able to generate a License key using the Android based License Key generator app for administrator. 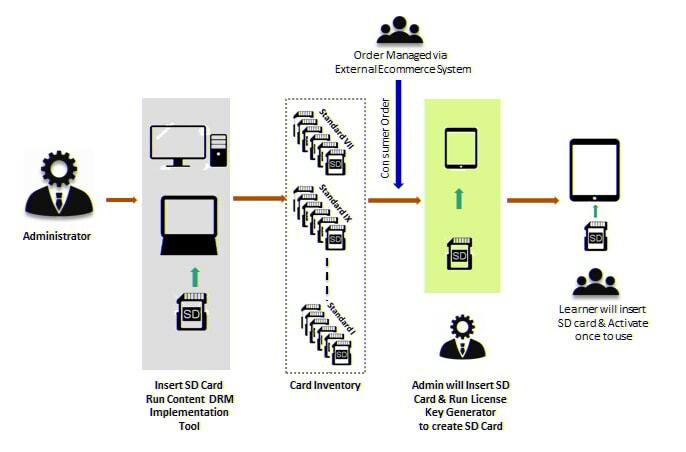 Once the License key is generated and requisite registration details added on the SD card, the card will be dispatched to the user.